We, the folks at PINK Armenia, would like to ask our supporters anywhere in the world to help us open safe community centers in Vanadzor and Gyumri – two major cities of Armenia. PINK Armenia was founded 10 years ago and is the biggest LGBT community based organization in Armenia. PINK Armenia provides a safe and secure environment for lesbian, gay, bisexual, trans* and queer people (LGBTQ) in Yerevan to feel accepted, explore their identities, and build social capital and connections with their peers․ In our organization, LGBTQ people participate in different trainings, receive individual counselling, social-psychological support as well as legal services free of charge. Whereas the aforementioned services are available in Yerevan, they can still be inaccessible for those living in the regions. And despite PINK Armenia’s efforts in reaching LGBTQ individuals in the regions through various events, they still face obstacles to benefiting from what PINK provides in Yerevan. For that reason, we aim to open two more community centers in two other cities of Armenia – Vanadzor and Gyumri. The costs, which include logistics, rent, refreshments in the center, and services by professional psychologists and lawyers, are estimated at around 33,000 USD. We would greatly appreciate if you could make a donation today. 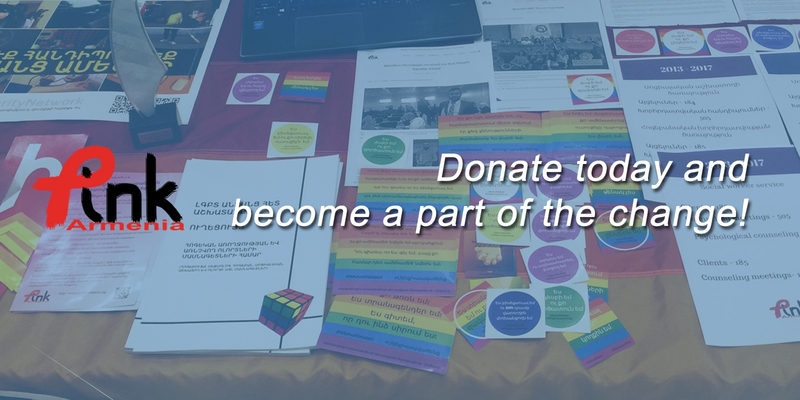 Your contribution will serve to empower LGBTQ community and allies to continue the fight for equality in Armenia, where, according to the statistics, 90% of Armenian society is homophobic. PINK Armenia’s work is vitally important for the safety, well-being, and development of the LGBTQ individuals in Armenia and for advancing and supporting the LGBT movement. It is, however, impossible to accomplish this work without your support. Your generosity will have an impact and help us make a difference! Donate today and become a part of the change!